Op. 18 No. 3 was actually Beethoven’s first string quartet. Still heavily influenced by Mozart and Haydn, he nonetheless introduced forward-looking elements. The musicians brought a light, cottony touch to the first movement without neglecting to accent its distinctive moments – transitional chords, for example, that bespoke a unique imagination. Some of the movement’s harmonic density, reflecting a daringness that presaged Beethoven’s later cycles, felt a little hesitant – though to be fair, my ears weren’t yet adjusted to the hall’s acoustics, which are suboptimal for a small ensemble. The space dissipates sound too thinly; I had to put out of my mind the brain-expanding sound I’d recently experienced in the much smaller Music Room at the Frick Collection. The musicians achieved a crystalline clarity as the pretty second movement alternated between a gently rocking beat and tick-tock staccatos. They struck a nice balance through the counterpoint passages, and created a haunting moment when the cello took the minor-key iteration of the four-note theme. The third and fourth movements showed off the musicians’ impressive technique, though the finale felt a bit rushed, with some crispness seemingly sacrificed in favor of maximum speed. I enjoyed Beecher’s three-movement piece. Composer in residence at the St. Paul Chamber Orchestra, and before that at Opera Philadelphia, he wrote One Hundred Years Grows Shorter Over Time for the Juilliard, who premiered it in Massachusetts in September. Its three movements do grow progressively shorter, and slower, but each captures attention. In the first movement, heated lines and harmonies erupt out of a kaleidoscope of notes; then the clouds break up into discrete, drifting bits of melody, non-traditional harmonies, and slides. A hint of a waltz written by the composer’s Estonian great-uncle smears away like paint dribbling down a wall, an effect that occurs in a more exposed way later on. A thicket of multiplicities and a tense conversation between first violin and the others trickle away into an uncertain vacuum at the movement’s close. Something about the intervals in the more sedate second movement reminded me of Bartók. Stops and starts suggest a speaker carefully measuring his words. The pace picks up with bursts of abbreviated melody in a mysterious time signature. Then muted strings sneak in for a quiet conclusion, and the music again vanishes into the ether. Sensitive playing continued through the very appealing finale with its light touches of humor. A sweet melody – the waltz, I assume – becomes prominent in the viola. A virtuoso atmosphere of sweeping motion over pizzicato playing from the cello has stayed in my mind. The composer emerged for a well-deserved bow; the Juilliard merited theirs too for a stirring performance of a notable fresh work. After intermission came a magnificent performance of Dvořák’s “American” string quartet. Pentatonic melodies help give this piece a folk flavor that hints forward at Aaron Copland. It’s easy to imagine the composer taking inspiration from the Native American culture he encountered during his stay in the U.S.
Melodic trade-offs came across with grace in the first movement. The second was glorious, with folksy themes worked into a fittingly old-fashioned cadence; the quartet made the movement’s soft feel resemble Mendelssohn’s Venetian Boat Songs, and it was easy to get lost in the quilted harmonic beauty. Cellist Astrid Schween again produced a gorgeous tone with the melody at the end of the movement. Zhulla, for her part, drew a sound almost like a piccolo’s in the Vivace third movement, which the quartet infused with rosy-cheeked energy. A bravo performance made a bright gallop of the finale to finish the evening off in high style. Areta Zhulla’s sparkling energy is a great fit for this long-respected ensemble, which includes, in addition to Schween, violinist Ronald Copes and violist Roger Tapping. 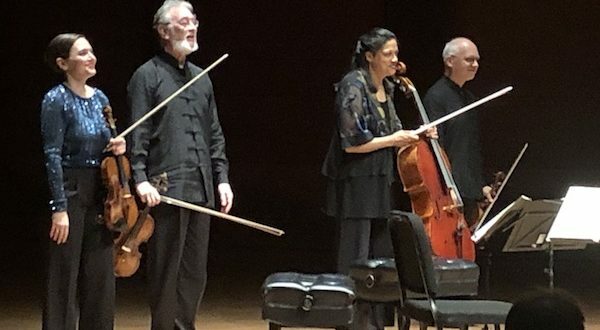 The Juilliard String Quartet will perform Lembit Beecher’s One Hundred Years Grows Shorter Over Time and other works from this program and more at upcoming concerts around the U.S. and overseas.